The best neighborhood in Los Angeles is …. well you already know, don’t you …. Glendale. Our city was elected Los Angeles’ best neighborhood by visitors to the Curbed Los Angeles website. In earlier rounds of voting that began in December, Glendale bested Koreatown, Highland Park and Hollywood. The finals were tough. We were up against the Los Angeles Arts District. Glendale emerged as the winner by a margin of about 60 percent to 40 percent. There were about 2,200 votes cast in the poll conducted by CurbedLA, a real estate blog. We’re not surprised. So much has been happening in Glendale this year. New stores such as Blomingdale’s at the Glendale Galeria and Nordstrom at the Americana. Great new restaurants along Brand. The revitalization and refurbishment of the Alex Theatre. And in 2013 we saw the introduction of our Ambassadors, a group of hard-working folks who keep our downtown streets clean and offer friendly directions and help to shoppers. The Glendale News-Press covered the news in today’s editions. There are these great comments from City Manager Scott Ochoa to close the article. “City Manager Scott Ochoa said the winning result was testimony to the efforts that have gone into improving downtown Glendale in the past few years. 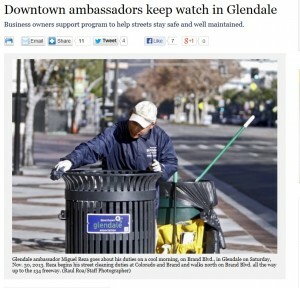 “I think as you look around the corner what 2014 and 2015 hold…I think you’ll see Glendale really is a great location to have some fun, and at the same time, be safe, and enjoy the environment in which to live,” Ochoa said.